Wave Carver sired two stakes finalist during trials contested Saturday om Hialeah Park's opening day. 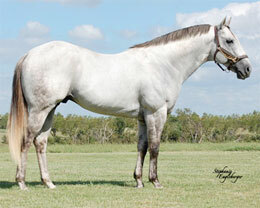 HIALEAH, FL�DECEMBER 15, 2012�World champion and #2 Leading Third Crop Sire WAVE CARVER sired a finalist to the $176,590 Hialeah Lassie Futurity and a finalist to the $192,520 Hialeah Park Quarter Horse Derby on opening day at the South Florida racetrack on Saturday. Jose Angel's lightly raced WAVE CARVER filly Whodo Ido qualified to the 400 yard Hialeah Lassie Futurity for 2-year-old American Quarter Horses. Conditioned by Brandon Muniz, the gray filly out of Baja Luna, by Corona Cartel, is 1-1-0 in four starts this season. She came into the trials off a win at Will Rogers Downs on October 6. Alex Baldilez, Jr., was aboard the Brad Tate Oklahoma-bred. Wave Carvers Cartel qualified to the 440 yard Hialeah Park Quarter Horse Derby with a second place effort in the third trial. Eduardo Morales trains the WAVE CARVER gelding for Anibal and Caridel Hernandez. Mercy Hinklin bred Wave Carvers Cartel in Texas from the Corona Cartel mare Cash Cartel. The gray has earned $21,048 with a 2-3-2 record from nine starts. We wish them both best of luck in the December 30 finals.